Having explored his world through drawing most of his life, William H. Skerritt—with educated eyes keen to find rhythm, pattern and ironic turns of form and function—has combined science and art with the romance of history and decay, and produced a huge body of work in a wide range of materials. Skerritt’s work covers a variety of subjects, including mathematical experimentation, dark humor, fetish and visual innuendo. 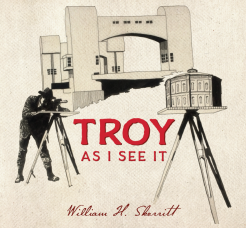 This collection of prints and drawings celebrates the city of Troy, NY through his very particular set of lenses, and his over five decades engagement with its buildings, substrata, history and important events.